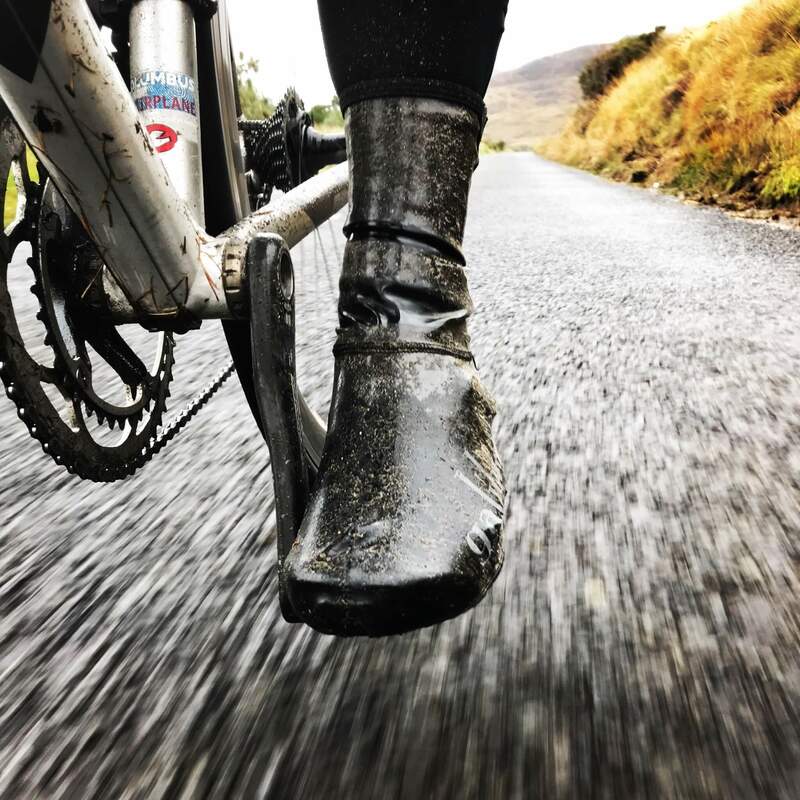 Cycling Foot protection from slow air or road spray. Lightweight, AERO Shoe Covers are ideal in windy and wet weather and offer great aerodynamics for time trialists or anyone else seeking extra speed. Our AeroCrono overshoe just went supersonic for 2018. For 5 years we have been perfecting these and they are honestly on the button. We have removed ALL seams from the main part of the shoe and increased the height of the ankle by 6cms. This means they have to be stitched ‘in shape’ and our factory worked with us, and made a new base for their sewing machines to permit our design. Aero gain is important for racing or time trials as the feet are rotating as well as cutting the air. They have utilised compiled data, from their own wind tunnel time, to advise us of both materials and design. 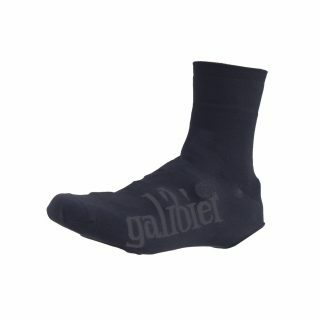 We chose a silicone-coated 1mm, silicone fired Lycra, which is tight fitting and stretches to fit the shoe exactly. The material is waterproof and the single line of stitching is internally taped: so will shield off road spray for racing in the rain. These are not waterproof, water eventually runs in down the leg and up from the sole, But they will to fend of most of the road spray and if you take care with clear positioning and don’t walk to the shop in them, they will do this for seasons. Contoured tailoring for a perfect fit around your ankle . Zoom. We have included Starlight elastic on each side of the rear mounted zip to ensure perfect fit and leaves the zip closure a breeze. We have widened this for this model to promote air separation of the airflow as it leaves the foot. This also ensures long life and leaves the tendons and muscles unbothered. A small tap is placed at the back of the heel to assist pulling them on. Toe and heel feature extra reinforcement against abrasion, and the so as to ensure increased comfort and water protection. The Velcro strap sole design is compatible with all types of road cleats. Stylish protection from the wind and rain. Although the material and seams are Waterproof, These are not, as we cannot stop water from ingressing down the leg or cleat. 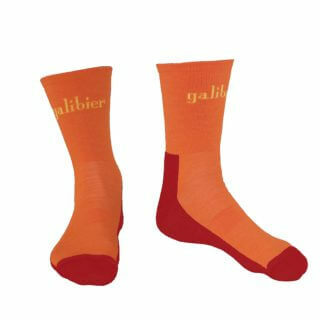 These will offer mid range thermal protection, as it is the cold wind that strips the heat from the feet. A must for TT, training or Road racing in the rain. 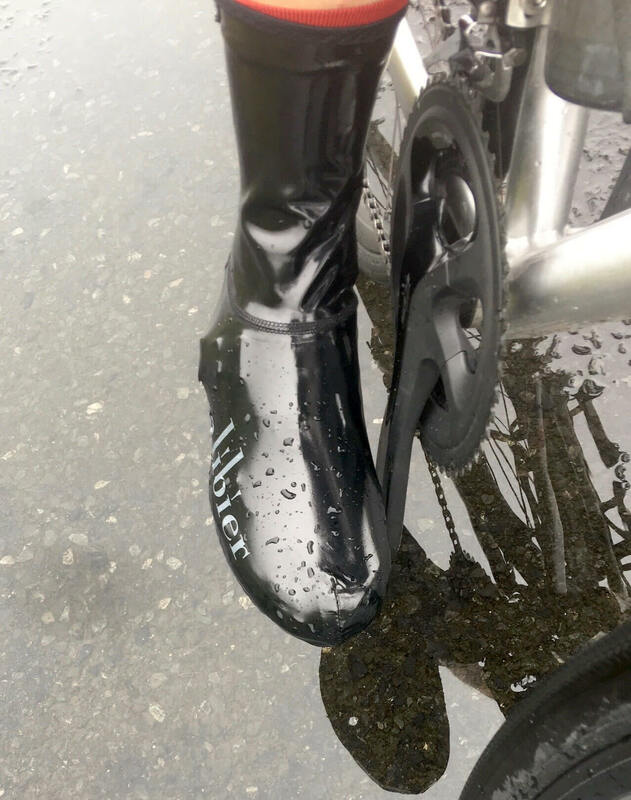 Overshoes love cycling. All overshoes will die quickly if you walk in them. Cycle- don’t walk. Concrete eats overshoes- so be nice to them- penguin walk on your heal and cleat. Least chance of slipping and the toe area will remain free from ground contact. Very easy to use, sleek and functional. Add to that plain and understated design and you have a great product. Tried other market leaders in this department, not a patch on these. 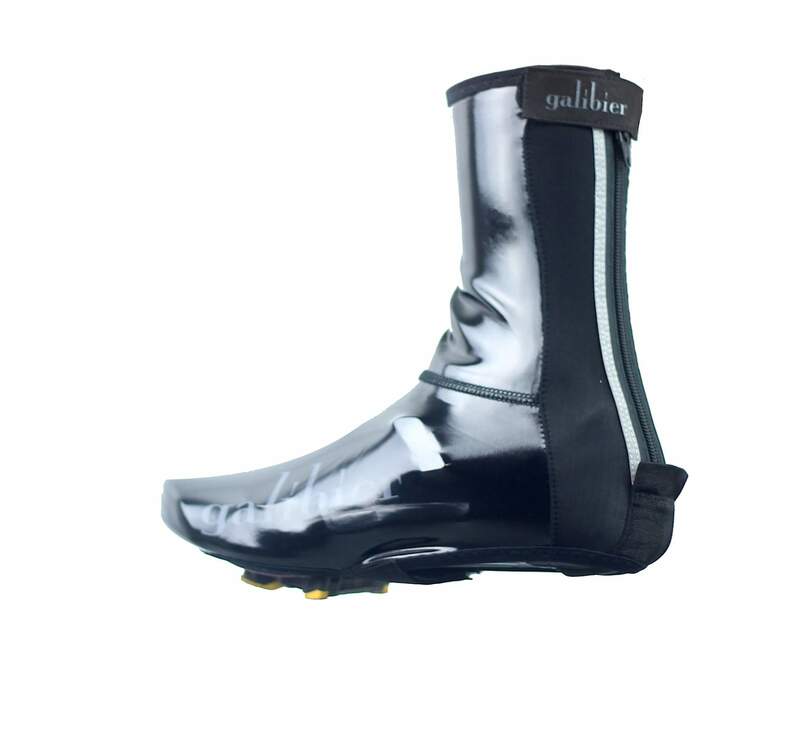 Superb slick overshoes that keep your feet dry and warm.Impeccably constructed,lay over laced road shoes snug and never moved.Worn through a couple of short deluge showers and a constant mist rain shower soaking.No water ingress despite constant road spray from the front wheel.Supreme design again from Galibier! I’ve been very impressed with these. 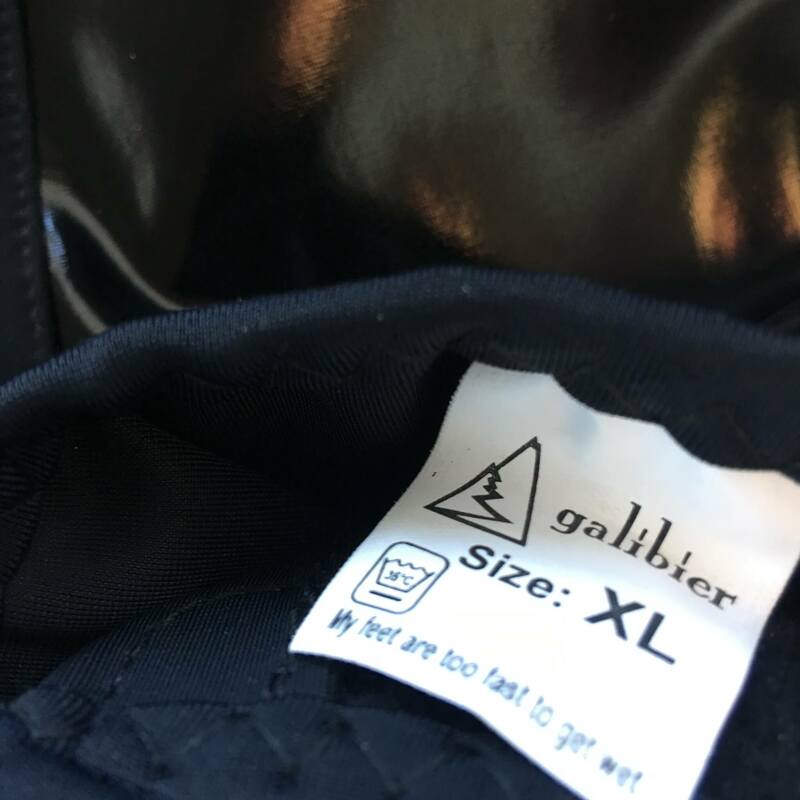 Snug fit (XL over Giro size 46), secure fastening, they lie flush over laced shoes they keep the water out very effectively. (Vents in soles of shoes are sealed with tape as a first line of defence.) They are easy to clean and dry quickly. I got a pair of these for Christmas and I’m disappointed to say that they’ve been really poor. They’ve let water in since my first ride and have started coming apart at the toe on one foot. I get soggy socks on my 15 minute commute. They also don’t close all the way up my calf. I’ve got the XL and I’m wearing a pair of Bont Riots, size 46 1/2. Maybe I got a duff pair? Amazing overshoes. My favourite ones. Well worth the money. Large for a 43eur size is a perfect fit.